She was old, bordering on obsolescence, under-powered and small. Her crew were the last scrapings of the barrel, a mixture of drunks, old hands and new chums, yet the Sapphire Sea carried as many hopes and dreams on her last voyage in the Timor Sea as the most modern of her cousins. Join her in Singapore as she sets sail on her final charter. The crew won’t mind and you’ll glimpse a way of life experienced only by those who had the good fortune to live it. I am a great fan of stories with characters who prove their strength and indomitability, or as one character- Randy- says, is indestructible in harsh circumstances. The Sapphire Sea was deeply satisfying in this respect. Action, suspense and a bit of romance makes this novel a good read both for ladies and gents. David Andrews has written an outstanding suspenseful story that will keep you on the edge of your seat. The Prologue starts out with the ship that has just sunk after an explosion and we meet Allan Shortland, the main character, a Marine Engineer, trying to save himself from the shark infested waters. Important moments of his life link Allan Shortland to the Sapphire Sea - He’d proposed to Sally while she sat in a chair on the ship's board and Melanie was conceived in a bunk of the same ship. But that was twenty years ago and things have changed. Sally's infidelity led to their divorce and now Melanie is getting married and wants her father to be present. As about Allan’s relationship with the crew, skippers felt themselves fortunate to have him on board, but he tolerated no nonsense and had the ear of the company hierarchy. Chapter One takes us back before the unfortunate incident, and offers glimpses into Alan's life. The story continues with the description of the crew - many of the members very 'in love' with their drinks, thus a real danger for the ship. Tom doubted their ability to see anything beyond the ring pull of the next beer can. He was not sure which of them is the drunkest. This determines Allan to take drastic measures, limiting the beer cans each of them is allowed. He hopes this will keep the troublesome crew at functioning level. His action will not remain without consequences. The abundance of nautical terms - gash can, soogee, deck head survey- shows the author's thorough research or involvement in sailing environment and adds to the book's originality; I confess I liked to learn new things so I wasn’t bothered by them. The Sapphire Sea offers a glimpse of how life is for those who earn their living on the ocean, as well as their families’ life. It is a well written suspenseful novel, which hooks you in from the beginning. The plot is intense, demanding, and full of hope. 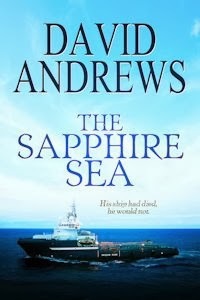 Curl up with your copy of the nail-biting suspense, The Sapphire Sea, today. I was offered a free copy by the author in exchange for my honest opinion. I rate it Five Stars. Thank you, Carmen. I spent forty-five years at sea and wrote the initial draft of the story when sailing as Chief Engineer on one of the ships named in the story. When I retired I spent seventeen years learning how to write before I re-wrote "The Sapphire Sea". It was my second "at sea" novel. The first was called "Coasting" and was set on the coastal trading ships of the Australian fleet in 1975. Very impressive. Congratulations! You have a gift indeed.